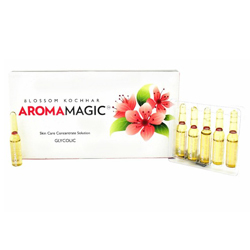 Aroma Magic Glycolic Serum Gives Extra Protection & Moisture to Dry & Delicate Skin. Glycolic Skin Care Concentrate Solution gives extra protection & moisture to dry and delicate skin. Hyaluronic acid a natural moisturizing complex promotes skin hydration and liposome’s transport water into deeper skin layers.